I am a BIG fan of Sierra Nevada… and while I knew they made several other brews, I am not sure I could tell you a single other beer they make. 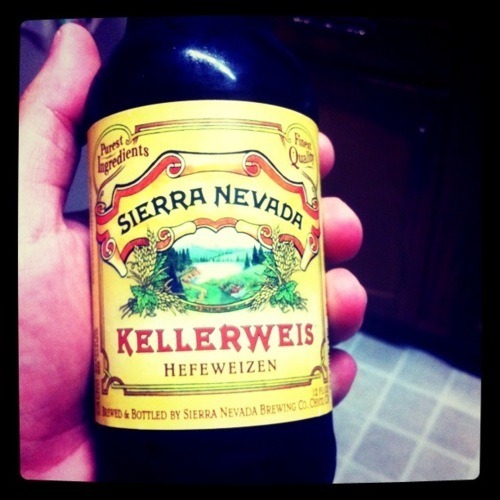 I just always go back to… to Sierra Nevada. But this beer is fairly new to the lineup, as it is only a few years old. It was actually not brewed until 2009. Needless to say, that doesn’t excite me so much… especially since beers tend to get better with age. The beer pours cloudy, almost like a wheat. But it’s not a wheat… it’s a hefeweizen. I would love to spend some time in Germany just hearing locals talk like this. I would order a Bud Light just to see their reaction! So what’s this beer smell like? It smells like a wheat. It has a few things going on in the nose… and I get a hint of spice that I am not used to. It smells different, but promising. But that’s it taste like? Better than the nose, that’s for sure. WAY better. What a great mouthfeel. Oh man, that is a good beer. One word that comes to mind is velvet… it’s smooth across the palate, and then settles toward the back of the tongue. It slides down the throat and leaves that typical wheat aftertaste, but a meager more sublet and accepting aftertaste than expected. There is little carbonation, and based on the head from this beer you would think it would be big… but it’s not… only smooth from start to finish. The beer has a pretty low ABV, which makes this beer extremely drinkable. It’s a good summer beer… and I don’t say that because it’s the summertime! I say that because it’s clean, crisp, smooth and just enjoyable. I really like this brew, and I would totally order this and buy this again. I had no idea they even made this, now I want to get a six-pack right now! Bottoms up people! It has been a while! I can’t remember the last time we did a beer at home. But here we are, back again. Tonight’s beer looks kind of like a Blue Moon. It is cloudy and a yellow-orangey color in the glass, with a medium amount of head. It doesn’t seem to have a lot of smell too it, but smells kind of wet and like yeast (as you would expect a beer to smell, right?). Let’s find out what it tastes like. It has a very citrusy taste to it at first sip. It also tastes a little carbonated, but not a lot. Just that bit of spark when you are taking a drink. Definitely very citrusy, with not a lot of aftertaste. I like it, but it’s nothing really too special. It tastes like a light, smooth, wheat beer. Not as heavy as Blue Moon, but definitely a good summer beer to drink out on your front porch on a warm summer evening. I might buy it again if it was on sale, otherwise I think I’ll stick with my everyday summer favorites, like Leinenkugel’s Summer Shandy (which I have a bottle of sitting nearby to drink after I finish this one).